In part one we covered what our responsibility to God is as we lead our families. Last time, we looked into our responsibility to our spouse as we seek to build a kingdom-minded family. This time, we’re answering the question: What is our responsibility to our children as it pertains to building a foundation for parenting? So, let’s take a look! a principle that reminds us that our children typically go the direction in which we point them. This directing takes a lifetime of pointing and teaching; it includes both spouses working to achieve a healthy balance of life’s obligations and also requires total intentionality and commitment from both parents to achieve this balance. But for as simple as this sounds, it’s not. Every person is different. Every couple is different. Every family makeup and situation is different and unique enough that applying a “one-size-fits-all” approach will never work. This is where both spouses have to take responsibility and put in a little work to determine a good and healthy balance. Life is ever-changing. And depending on activities (like soccer, basketball, and dance) it changes as you go and as they grow! How you prioritize where God comes into this picture is determined by your values. We’ve already seen in parts one and two that everything flows “from the top, down,” so that is where we MUST begin. In part one we saw that when we put God first, everything, including what we do with our time, flows outward. The pattern, then, of developing strong character, integrity, and enduring relationships with people begins by developing a strong relationship with God. This ‘top-down’ approach is key, and it flows into our marriage and the rest of the family, specifically our children. This growth amongst us as parents is also reflected in the lives of our children. This value system of putting God first defines and drives what our obligations are concerning parenting, just as it does all other areas of our lives. So, what are our obligations as parents? What does the Bible say? 1. We are to TEACH our children a healthy fear of the Lord. It takes two to have a child, and it takes a lifetime to raise a child! And both parents share this responsibility. In the Old Testament, we see the importance of laying a good spiritual foundation for the family. …that you may fear the Lord your God, you and your son and your son's son, by keeping all his statutes and his commandments, which I command you, all the days of your life, and that your days may be long… And these words that I command you today shall be on your heart. You shall teach them diligently to your children, and shall talk of them when you sit in your house, and when you walk by the way, and when you lie down, and when you rise. You shall bind them as a sign on your hand, and they shall be as frontlets between your eyes. You shall write them on the doorposts of your house and on your gates. These are the commandments God gave to Moses for the success of the future generations to come, and we can learn a lot from them. This passage tells us a lot about the lengthiness (“all the days of your life”) of child-rearing. It also tells us that we should use every moment (“when you walk…lie down…rise…”) as opportunities to teach our children to fear the Lord. We are to WORK for our children. Work is not only necessary for provision, it is also required for setting a proper and good example in the minds and hearts of gullible, shapeable, and moldable children. We are to DISCIPLINE our children. There are many differing opinions on what methods of discipline are appropriate, but there is no question about the fact that some kind of discipline is a necessity for raising healthy children. We are to PROTECT our children in PRAYER. …and give to my son Solomon a perfect heart to keep Your commandments, Your testimonies and Your statutes, and to do them all, and to build the temple, for which I have made provision. In this passage, we see David protecting his son with prayer. David knew the task that was set before his son was heavy, so he goes to God for him. We are to PROTECT our children in WISDOM AND INSTRUCTION. Find out your family history. Find out what is important and good, and give wise counsel to your children just as Isaac did with his son Jacob. The pressures our children receive from our culture on a daily basis should be enough for us to be vigilant with instilling wisdom and instruction in them. If we care about our children’s futures, then we must spend the time equipping them now. It is never too late to begin instruction. If you haven’t, start now! Although every family is different, these obligations are non-negotiable when it comes to raising children. You must be willing to invest the time into your children. On the other hand, some things you just have to figure out on your own, based on your family needs. Before I conclude, here are some practical ideas from Tonya, my wife, which may help those with young and growing families. Schedules help keep you organized and can reduce stress, but they can also give you anxiety when they are too busy. To counter the anxiety of busy schedules, I find that setting bedtimes is helpful! This allows you to prioritize time with your spouse in the evening. As parents, we feel the need to enable our children to achieve and produce constantly. While it is wonderful and important to enable our children to succeed, it’s necessary to set limits on extracurricular activities so that we don't spend our entire evenings being a chauffeur for our children. As a working mother of older children, household chores are for everyone, so no one person is carrying the full load! Attempt to sit down at the table for dinner most nights during the week. This helps break up the fast pace of life and creates time for your family to talk and fortify their relationships. 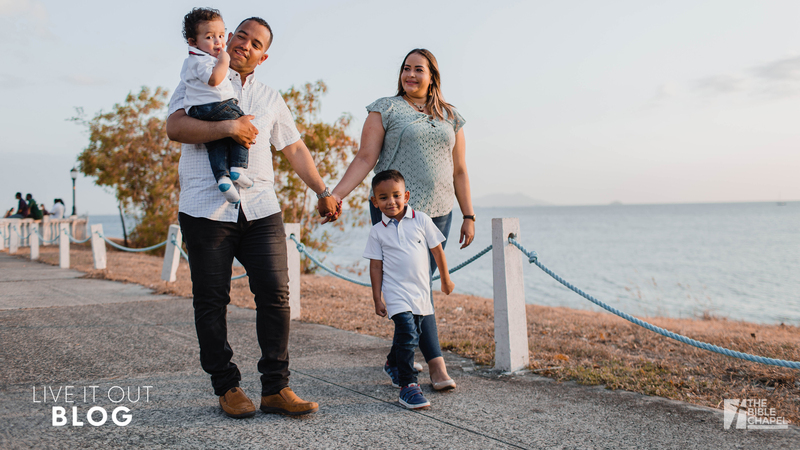 These are just a few of the practical things that help us keep up with the obligations and schedules of having a family. Do what is right and necessary for the health and success of your unique family, and be willing to adapt and adopt the dos and don’ts that are proven. Then, time will tell us whether or not it was worth the investment! I want to end with an overview by reminding you that the success of our families starts with the relationship between God and us (vertical) and then flows down and outward (horizontal). We then take what we’ve gotten from God and apply it to our Marriage. We use what we’ve learned about healthy relationships, loving our spouse (Ephesians 5:22-33), and the importance of truth (John 17:17-19), and apply these lessons as we grow our marriage. - Love, respect, trust, etc. Finally, we take what we’ve gained from God and our spouse (the things listed in 2-3), and we invest it into our children. May God bless you as you lead your families!